RVs and campers are subject to manager approval. RVs must be in good clean condition. Owner or his designee must assist you in pulling into your space upon arrival. Damage to your vehicle could result from hitting a water, sewer or electrical hookup. For your personal safety, DO NOT dig or drive stakes into the ground without permission due to underground electrical cables. You are responsible for the conduct of anyone visiting you during your stay. Quiet hours are from 10:00pm - 8:00am daily. Please be considerate of your neighbors at all times. No loud music or unruly conduct. Alcoholic beverages are permitted at your site only. Please keep visibility to a minimum. Illegal drugs of any kind are not permitted. Unruly conduct, loud or obnoxious behavior will result in your removal from the park, cancellation of rental privileges and no refund. No open campfires, but gas and charcoal grills are allowed. The park operates on a septic system. All septic connections must be air tight. No duct tape. Your site should be clean and orderly at all times. Pick up litter, cigarette butts, etc. Anyone damaging or destroying property will be required to pay all associated damage charges and will be asked to vacate the property. Please do not cut, climb, or put anything in the trees. Please store all items except patio furniture neatly under RV. Let us know of any conditions requiring our attention. Per county ordinance, tents are not allowed. Please park in your designated gravel lot only. 1 vehicle per site is allowed. Check with management for availability of extra parking for guests. Washing vehicles in the park is not permitted. Do not drive through empty sites or park on grassy areas. No vehicle maintenance - only minor emergency repairs. No riding ATVs on the premises. Pets must be approved prior to arrival. We reserve the right to limit number, size or type of pets. No vicious or aggressive animals are allowed. Pets must be housed inside your RV unit, and must be kept on a leash at any time they are outside the RV unit. Please clean up immediately after your pet by discarding solid waste in a plastic bag inside a trash can. We are not responsible for accidents or injury to guests or property, for loss of money or valuables of any kind, or damages or claims due to fire, theft, accident, acts of God and nature or any other cause. We reserve the right to amend guidelines as necessary. 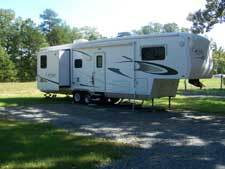 We reserve the right to evict any person without refund for failure to observe RV Park guidelines. We reserve the right to refuse service to anyone.